The Swarovski crystal company produced some very exotic and colorful birds which are a part of the Crystal Paradise theme group. These four Swarovski Birds range in height of 7.5 – 11.5 inches in height and are affixed to a natural-colored wooden pedestal. All the birds in the Crystal Paradise group all retailed for $950 when brand new at the Swarovski stores. Swarovski Green Rosella – 9600 000 085 / 901 601. This Swarovski bird was produced 2007 through 2010. Heinz Tabertshofer was the Swarovski designer of this figurine, the only Crystal Paradise bird by him. The Green Rosella is mostly yellow, with blue tips on the tail and wings. Swarovski Cockatoo – 9600 000 020 / 718 565. This Swarovski bird was produced 2001 through 2004. The Swarovski designer was Roland Schuster. It is a pretty pink cockatoo with a red, yellow, and white plume. The crystal brand also made a much smaller clear Swarovski cockatoo 2001 – 2006. Swarovski Macaw – 9600 000 011 / 685 824. This Swarovski bird was launched in 2005 and while it is listed as a 2011 retirement, it is no longer available for purchase in the Swarovski shoppe online. Roland Schuster was the Swarovski artist credited with this design. The macaw is a beautiful bluish green with other colored accents. Our favorite crystal brand also produced the Swarovski Thimbles which were frosted birds perched on clear thimble-type bases. The birds on the thimbles include: Eagle, Cockatoo, Owl, Parrot, and Toucan. So why write about the Swarovski Crystal Paradise Birds now? Well these birds are quite expensive, and quite large. Some display cases are not even capable of displaying them due to the height of the crystal figurines, so collectors may shy away from them. However, in the past 2 months, we have seen a jump in sales of them….especially in the Swarovski Black Diamond Toucan. 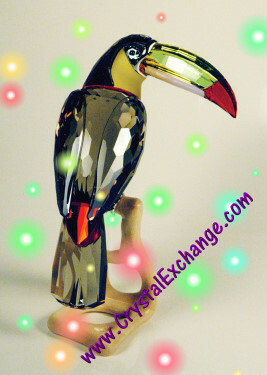 Swarovski crystal collectors are reporting that the toucan is particularly hard to find. If you are bird fanatics or crystal fanatics and have only a partial set of these big birds, but wish to have an entire set, you may wish to complete your collection soon before the rest of them become hard to find. At the Crystal Exchange America web site: www.CrystalExchange.com , all these Swarovski birds can be found in the ‘Birds’ category of the store. Swarovski Paradise Blue Roller Bird on Sale! Yesterday, I got an email from the Swarovski about a current sale, for 30% – 50% off select items. Among the crystal figurines on sale was an expensive item in the Paradise line…the Swarovski Blue Turquoise Roller Bird. The Swarovski Blue Roller is a large crystal bird figurine, about 10″ wide. The Swarovski Roller (9600 000 125 / 957 568) was designed by Anton Hirzinger. The bird is blue turquoise and black diamond in color. The bird is attached to a metal stand. The Swarovski Roller is in the Silver Lake collection of the Paradise line. Originally introduced in 2011, it had a retail price of $950. The sale price now is $570! Now is a great time to purchase the Swarovski Roller if that is a crystal figurine you were planning to add to your collection. As the Kingfishers, Bee-Eaters, and Woodpeckers are still current, they can be purchased directly from the Swarovski store. The other retired figurines can be found at www.CrystalExchange.com in the Swarovski Birds category of the online store. Tweet tweet for now! Swarovski introduced the Swarovski Paradise figurines in 2000. I think the real significant feature of the Paradise line is that it was the first line to be in all color, not just using color for highlights. In this initial launch of the crystal creations, all the Paradise figurines were insects: Swarovski Paradise Bees / Bumblebees, Swarovski Paradise Beetles, Swarovski Paradise Butterflies, Swarovski Paradise Dragonflies, Swarovski Paradise Flies, Swarovski Paradise Grasshoppers, & Swarovski Paradise Scarabs. Swarovski created the Paradise ‘Exotic Fish and South Sea’ in 2004. There were approximately 19 different figurines in this collection. Nearly all of the ‘Exotic Fish and South Sea’ were retired by 2007. The Paradise ‘Exotic Flowers’ was launched in 2006. As of today, there are about 11 items in this collection. Some of the Exotic Flowers are retired and some are still being produced. Overall, there are over 190 Swarovski Crystal figurines that have been connected with the Swarovski Paradise line. Over the course of time, unassigned figurines have been introduced into the Paradise line, perhaps because of the significant use of coloring. The Cockatoo, Macaw, Parrot, and Black Diamond Toucan are examples are some of them. At present, Swarovski does not utilize theme groups within the Paradise line, but the Paradise birds are in the ‘Silver Lake’ collection. Now, after the brief history lesson, I can reveal that there is a web site with the Swarovski Paradise Retirements in a free and easy-to-use format. http://www.retiredswarovski.com/ has a series of web pages with Swarovski Paradise Retirements, 2002 through 2010. If you want to know what year a Swarovski Paradise figurine retired, type it in the ‘search’ box of the site, and the results list will indicate a list of possibilities for a collector to select from to make getting the retirement year (answer) successful. At RetiredSwarovski.com, it is also possible to print out the fact sheet listings by year of Swarovski Paradise retirements, 2002 to 2009. The fact sheets are very useful in knowing which figurines retired in which years. The fact sheets include small photos, Swarovski Name, Swarovski Part Number, and Year Introduced. Crystal Exchange America has a selection of Retired Swarovski Paradise figurines in their online store. If there is a Swarovski Paradise crystal piece missing from your collection, give them a shout to see if they have it available now, or if it is something that they can locate for you.